TOP STORY: Think you can't afford college? Then you should check out something called "My inTuition"
Back in 2008, Congress passed a law requiring every college to create something called a "net price calculator". These calculators were supposed to make it easier to figure out the actual cost of going to college. Fast forward six years later, and now every college has one of these calculators. But as @DLeonhardt writes in the New York Times, the rollout of these net price calculators has been — pretty much — a disaster. Students have to create a different account for each school's calculator (which becomes a huge pain) and each one has an overly-complicated set of questions. The user experience is so bad, in fact, that students abandon 70% of the calculators before they even finish filling them in. But now help may be coming from an unexpected place. That place is Wellesley College, the legendary liberal-arts college just outside of Boston. One of the economists at the school, Phillip Levine, has designed a calculator that's much easier to use. 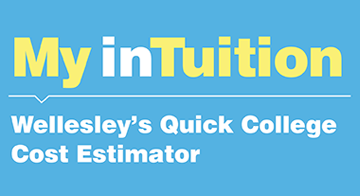 And now this new simplified calculator — which is called "My inTution" — may become the standard that gets used by more colleges across the U.S.
Read the great article here, and check out a short video below from some students at Wellesley. And let us know your thoughts in the comments section. Do you hope that more colleges start using My inTuition?